Succulents and terrariums are in style! I should say back in style because I had an awesome Jade tree way bay back in the day and I have made a few terrariums in my past too! 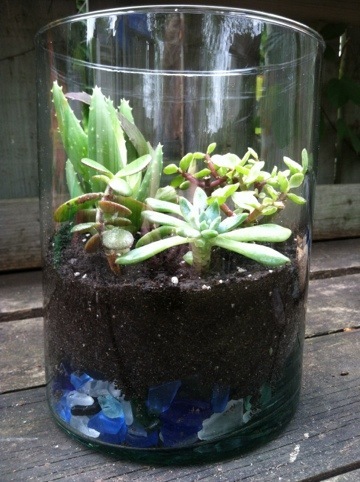 Recently I have seen a few beautiful succulent terrariums on the Internet and I love the look. Unfortunately I don’t think succulents would like the humid environment of a terrarium. I’m willing to give it a try because 1) A terrarium would be harder for my plant chewing cats to get into to and 2) I have access to cheap succulents 3) I wouldn’t want to miss out on a chance to in style. I found a glass dish at a discount store and I liked the slight green tint and the price so I decided to give it a try for my succulent terrarium. Because this dish has straight edges I am hoping that water will be able to evaporate easily and that humidity won’t be a problem. Just to be safe I started with a thick layer of sea glass so there will be good drainage. 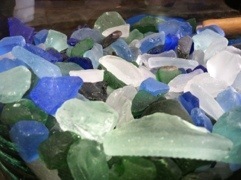 I used sea glass because I had a bag full left over from another project from my past! I called upon my sister for most of my plants because she takes cuttings of her plants and roots them. She was kind enough to give me several of her “baby” plants. The others I bought along with a bag of good quality cactus/succulent potting soil. I put a layer of the soil over the sea glass layer, and then arranged my plants in the dish. I decided to have a front and a back so I tried to place the taller plants to the back. 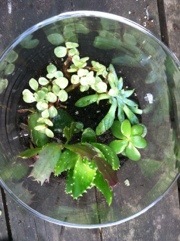 I was a little too rough and broke off a few leaves – don’t tell my sister that I hurt the babies! I am going to save the broken pieces and see if they will develop roots. I’m happy with the way it turned out – now I just hope it survives! I promise I will post an update to let you know how the succulents are doing with the cats and possible humidity! Want to try one too .thanks Jess —love your blogs.